James Lewis Dalton (1866-1926) (see biography of James Lewis Dalton) was a successful businessman and amateur mechanic from Poplar Bluff, Butler county, Mo. He was the owner of the largest department store in the Mid-West, member of Missouri legislature and District Deputy Grand Master of the Masonic Lodge of State of Missouri. How this venerable businessman and public figure entered the world of mechanical calculators? In early 1900s, the famous adding machines constructors William and Hubert Hopkins desperately needed money in order to manufacture and put on the market their inventions. 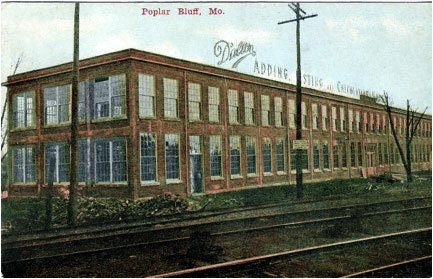 So in December, 1901, William Hopkins went to Poplar Bluff and there succeeded in interesting Dalton and others of that city in financing his enterprise. The result was that a contract was entered into by and between the Hopkins brothers and Dalton and his associates by which the latter agreed to furnish $2500, a part of which was to go to the former and a part of it was to be expended in the manufacture of the first machine, so as to demonstrate its practicability. Shortly after this agreement was made the Hopkins brothers built the machine in St. Louis, using a part of the $2500 for that purpose. In January 1902 Dalton went to St. Louis, and Hubert Hopkins show him the prototype of an advanced 10-key adding machine. Dalton was impressed by this machine, and in June 1902 additional sum of $1250 was put up by Dalton. In consideration of money granted, Hopkins brothers were to assign to Dalton a half interest to a company thereafter to be organized. The machine was completed in September, 1902, and in December 1902 the Addograph Manufacturing Company was founded (50000$ shares), half of shares owned by Hopkins brothers, the other half owned by Dalton. Dalton was the president, and Hubert Hopkins was the director. 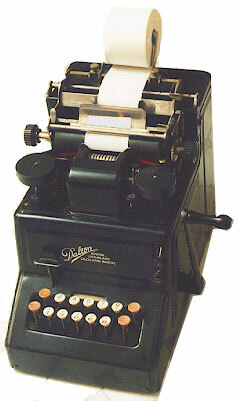 However, in 1903 Hubert Hopkins began an unfair game and secretly sold his stock in the Addograph Co. to American Arithmometer Co., the manufacturer of the famous Burroughs Adding Machine, and with additional shares it had bought, gave it control of the Addograph Co (for this and for other similar cases later on American Arithmometer will be sued for "Conspiracy, Attempt to Monopolize and Monopoly"). As the patent application for the machine, filled in January 1903 (see the US patent No. 1039130), was assigned to Addograph Co., this action threatened the investments of Dalton. To regain control, Dalton paid to American Arithmometer $40000 for the stock (Hopkins had sold this stock for only 5000$, and this prove to be a very bad decision, because using his patent Dalton will become a millionaire later). Thus Dalton was granted the exclusive right to make and sell the machines, what he did, founding in July 1903 a new company—the Adding Typewriter Company in Poplar Bluff, Missouri. 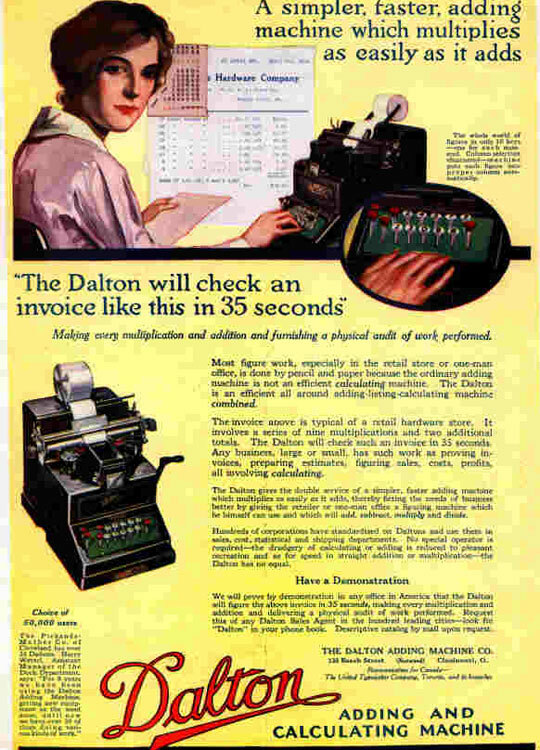 The company later changed its name to Dalton Adding Machine Company. 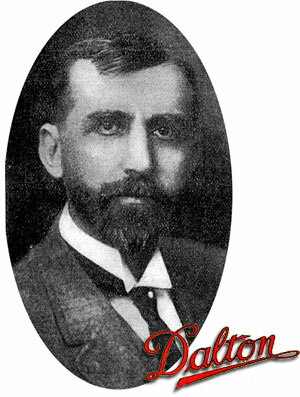 Since 1904 Dalton gradually turned the store over to his son and others and devoted his entire time to the adding machine, engaged as a "president, general manager, factory manager, timekeeper, paymaster, bookkeeper and chief salesman", always working at least 14, and sometimes more, hours daily. The first factory was in a side room and during that period the three or four mechanics who built the first machines watched Dalton leave on a sales trip with great interest, because, if he didn't make a sale they didn't get paid. But after a few years, aided with the capital of friends, and a refusal to become discouraged and quit, success came his way. In 1909 the company relocated to a purpose-built factory building (see the upper image). The machine began to sell on the market and 200 sales offices were ultimately opened up in different parts of the world, and sales ran up to $1,000,000 worth a month. First model was released in 1907, and after extensive advertising campaign in 1909 it became a market hit. Earlier models had glass inserts to allow customers to view the gears actually calculating the answers. By the 1920's over 150 models of Dalton Adding Machines had been designed and over 50000 machines were sold. In 1915 the price was $125, while the 1926 price was $100. In 1919 it was stated that the US government had over 3000 Dalton machines. A full description of the operation of the machine can be found in the Dalton Instruction Book. Many people might consider it humiliating to start out selling adding machines with a heavy sample bag packed under his arm and interviewing the same people whose merchandise purchases had helped swell his former business to the $750000 mark. Perhaps it was hard but James L. Dalton did it just the same. During his lifetime, he managed to progress from $12 a month clerk in a hardware store to the presidency of the Dalton Adding Machine Company, a $10000000 concern manufacturing upwards of 60000 machines a year and with agencies throughout the civilized world employing 2500 persons. After the death of James Dalton of acute appendicitis on January 11, 1926, Dalton Adding Machine Co. merged with other companies to become Remington Rand in 1927.